The exterior of Mamacita. Photo via Facebook. 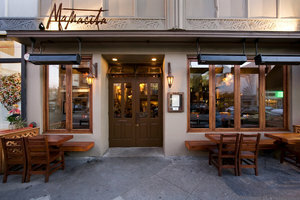 A sudden closure this past week was ~MAMACITA~ on Chestnut, after 12 years of business. Partners Stryker Scales and chef Sam Josi will reportedly be coming up with another concept for the space, while partner Nate Valentine has moved on to his own new project, August Hall. I was reading one of my weekly Nextdoor neighborhood updates and learned ~THE CORNER STORE~ in Anza Vista/Laurel Heights has closed after five years in business. You can read their farewell note on Facebook. Their burger and butterscotch pudding will be missed by many regulars. Tablehopper tipster Jason B. sent along a pic of a farewell letter from ~POLKER’S~, which is closing because they lost their lease after more than 20 years on Polk. The sign mentions their last day is April 2nd, and the East Bay’s Troy Greek will be moving in with a fourth location, their first in SF. 2226 Polk St. at Vallejo.